The town of Pienza owes its actual design to Pope Pius II, who renamed and redesigned the city in the late 15th century. Situated at about 1 hour south east of Siena (about 2 hours from Florence) it is today considered one of the most beautiful examples of Renaissance towns in Italy. The enchanting piazza is surrounded by symmetrical and well-structured 15th century buildings – among these we can find the cathedral as well as the Piccolomini Palace, the Borgia Palace (or Episcopal Palace), the Presbytery, the Town Hall, and the Ammannati Palace. 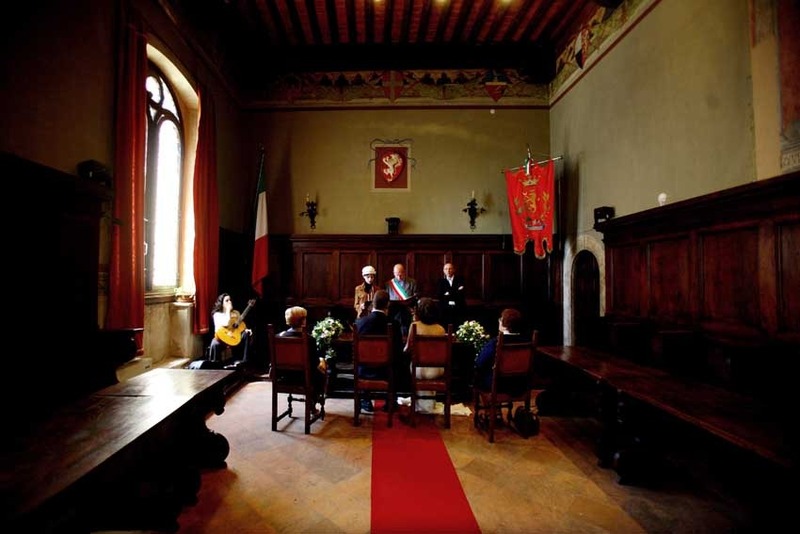 Your civil wedding ceremony will be celebrated in the Palazzo Comunale situated on the main square just across from the Duomo. 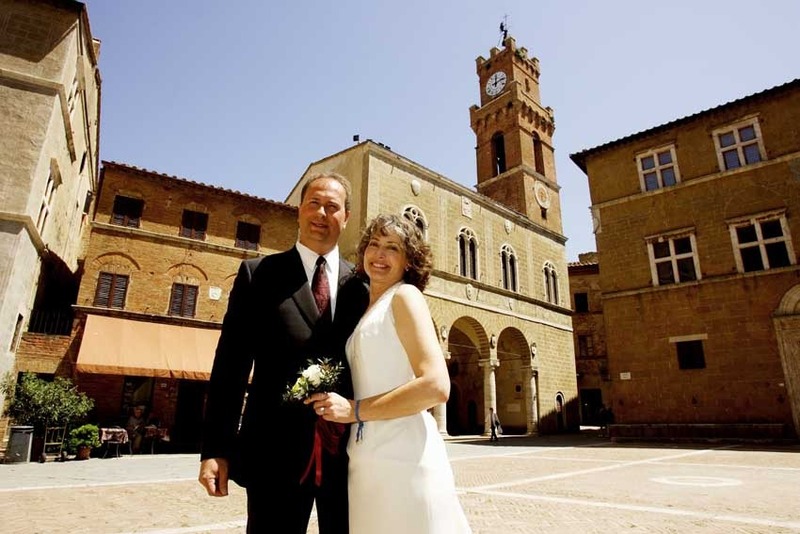 The Town hall is a 15th century building: it has a three-arched beautiful loggia on the ground floor and on the first floor there is the council chamber where civil wedding ceremonies take place. The Palazzo also has a brick bell tower that, in line with the periods culture is shorter than its counterpart at the cathedral, to symbolize the superior power of the church. 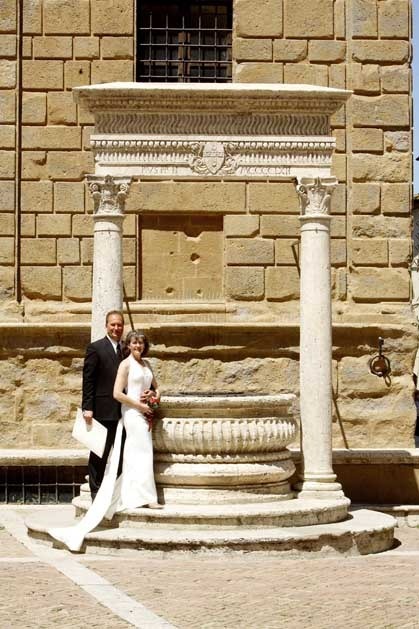 The travertine well on the main Piazza was widely copied throughout Tuscany during the following century and is definitely a beautiful setting for wedding pictures since no traffic is allowed in the historical centre. The marriage hall preserves the typical Gothic furniture with beautiful frescoes, antique chandeliers and historical heraldic devices. The hall is bright thanks to the large windows facing the lovely Piazza del Duomo and can host up to about 30 guests. 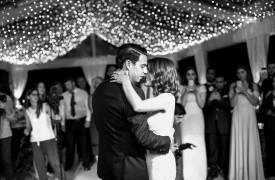 This is an ideal venue either for small or medium size weddings. 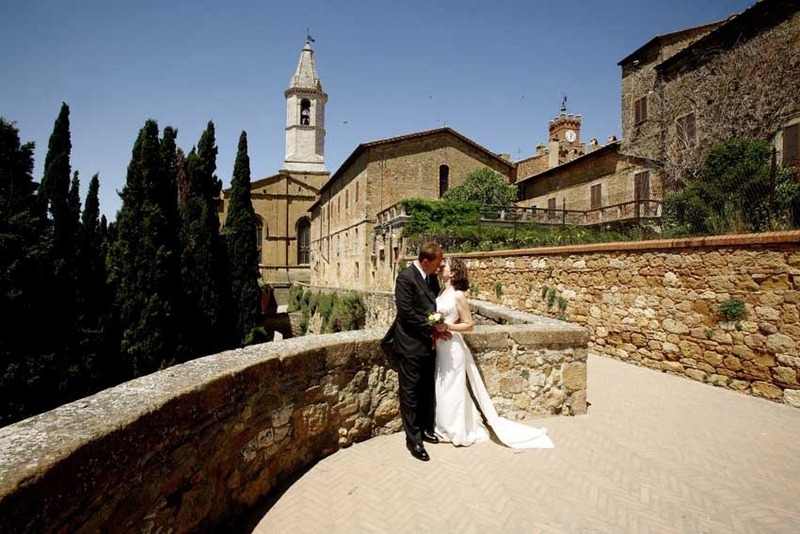 We love to recommend Pienza for the special atmosphere, an ideal city to celebrate your romantic Italian wedding immersed in the most stunning and unforgettable Tuscan countryside. 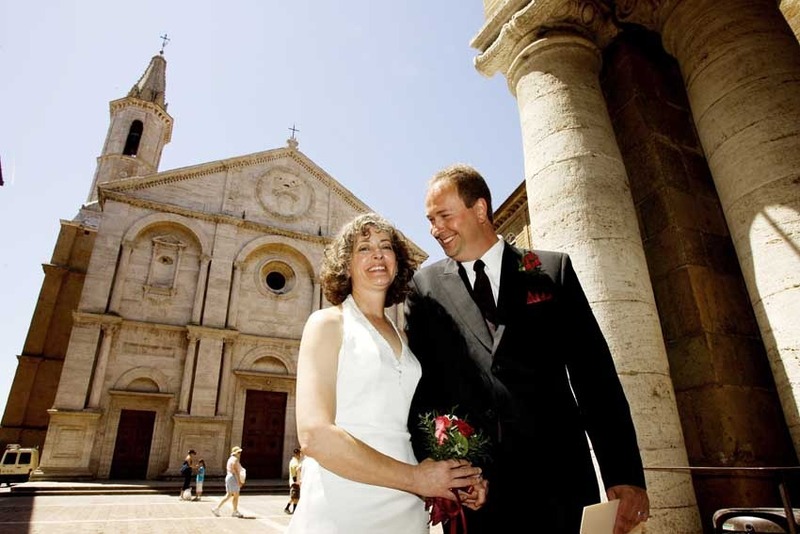 Formalities before the wedding are not requested, wedding ceremonies are celebrated in Italian and then translated by an official interpreter. Civil Ceremonies can be held Monday to Saturday from 9.00 to 1.00 pm – they expect payment of the Wedding hall fees at the time of booking.